Downtown Languages partners with the Springfield and Bethel School Districts, Lane ESD Migrant Education Program, United Way of Lane County, and other community organizations to offer the Pilas Family Literacy Program for Spanish-speaking families. The program, for families with children ages 0 – 13, offers ESL classes for parents, a preschool classroom, reading and writing for K-3, a homework club for grades 4 – 8, and family and cultural activities. Childcare is provided. Teenagers 14-17 can volunteer in the classrooms. 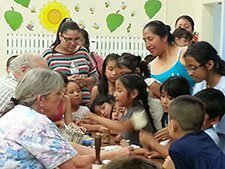 Pilas is offered twice a year (fall and spring) in Springfield and Bethel/Eugene. Classes meet two evenings a week for 10 weeks. Families accepted into the program receive full scholarships to attend. Spring 2019 Pilas session begins April 1 in Springfield and April 2 in Bethel/Eugene. Download the Spring 2019 Pilas Flyer (English/Español). Please call the Lane ESD Migrant Ed Program at 541-461-8382 or Downtown Languages at 541-686-8483 to register or for more information. Puertas Abiertas/Pasos al Futuro Summer Leadership Academy is a FREE! 2-3 week summer program for Hispanic youths ages 16-21. Activities vary from year to year, but generally include leadership activities, financial literacy, story telling, goal setting, art, scholarship writing, job shadowing, résumé writing, field trips, more.